Proliferate Poppies – from 5000 to 200,000! Check this out! This is the 5000 Poppies Project I crocheted the poppy for a few months ago and told you all about. You can read about it on my blog post here. It seems that there has been much media coverage of late and so much interest and I am just so thrilled to hear that the 5000 Poppies Project has received this kind of support! An example of part of the 5000 Poppies installation. It will certainly look amazing once all 200,000 poppies are sewn together! Such a lovely idea and remembrance for those that served. I can’t wait to see the final installation this ANZAC Day. And I have to say, it does feel good to be involved in a home-grown, very Aussie, community project from so far away. Feeling quite patriotic, actually (humming … Once a jolly swagman/Camped by a billabong …). If any of my Aussie readers happen to see the finished project would you please take a pic and post it for me? I know the display will start in Melbourne on ANZAC Day (April 25 for those unfamiliar) but as I understand it the plan is to travel around the country to display the finished piece all over during the 100th anniversary year (this year). So it may well come by your neighbourhood sometime. Keep a look out for my little poppy I made in honour of my Great Grandfather, Pvt Edgar Gibbons! 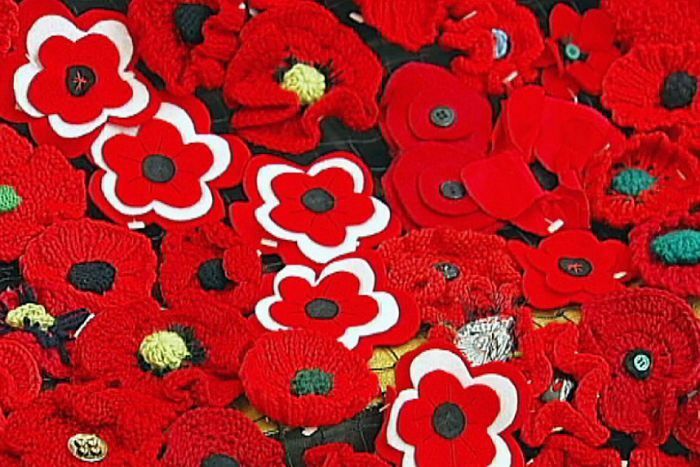 Two Melbourne artists behind a project to create 5,000 handcrafted poppies to commemorate the 100th anniversary of the Anzac landings say they expect to finish with about one kilometre’s worth of flowers. Lynn Berry and Margaret Knight started the project in June 2013, and thanks to other volunteers, their 5,000 poppy target was shattered and they are now on track to reach 200,000. Margaret Knight told ABC News Breakfast the project was initially a way for the two women to commemorate their fathers’ war service. “We were into commemorative art and we decided to do what we call a ‘yarn bombing’ around the battalion tree [for the battalion] that Lynn’s father fought in, and on the walk to the shrine,” Ms Knight said. Lynn Berry said the idea quickly snowballed. “Everybody was asking, you know … do you mind if I knit a couple, my mother would like to knit a couple, my aunt works at a retirement village and the retirement village ladies would like to knit a couple,” Ms Berry said. 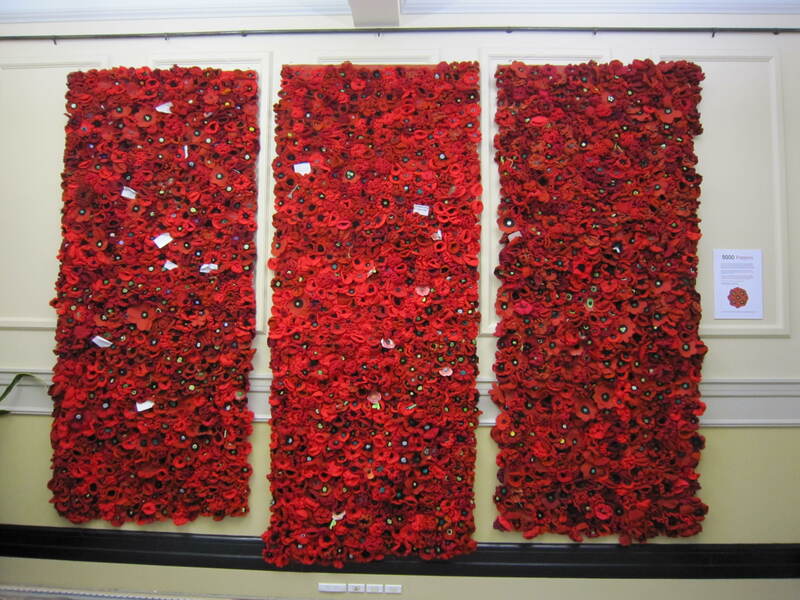 Ms Berry said the project had now collected about 170,000 knitted, felted and crafted poppies. “And we’re expecting by the end of it to have somewhere in excess of 200,000,” she said. The poppies will be assembled onto nets and placed around Melbourne as fields of poppies. She said the finished product will be beautiful, because no two poppies are exactly the same. “Well, many of them follow the same pattern, but everybody puts their own slant on them,” Ms Berry said. Ms Knight said the project was also initiating plenty of conversations among families. “I think it’s encouraged people to have a look into their family history of service,” she said. The poppies will go on display at Melbourne’s Federation Square on Anzac Day. ← Waste Not Want Not. Right? Ahh, no doubt. Do you knit or crochet, Sarhn? I kinda get the impression you might. I also knitted and sent a pair of socks for an Anzac Day installation through the Sydney libraries called Socks for Centenary. We were asked to follow an original 1914 pattern issued by the Red Cross to make the socks that, originally, were sent to the diggers in WWI. My socks will eventually go to the Wayside Chapel. Feeling very patriotic and connected to my Anzac-ness right now. Aussie Aussie Aussie! I could imagine days like ANZAC Day and Australia Day would be hard to be abroad – I would feel homesick at such times. No I actually don’t knit or crochet. My mother is a brilliant knitter and has tried to teach me but I realised the only time I could knit is at night which is when I am working. Maybe in a couple of years.